Owen Churchill and Nectar Gan wrote on 20 April 2019 in the South China Morning Post that “Leica’s ad agency denies releasing Tiananmen Square ‘Tank Man’ film without approval”. A promotional video that presents several vignettes of photojournalists documenting violence and conflict around the world became a controversy not just between the company Leica and China but also between two companies. 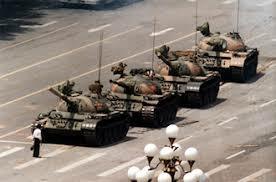 A recurring scene features a photographer who captured the famous image of a civilian blocking a column of tanks the day after the Chinese military’s deadly crackdown of protesters in June 1989. As the photographer’s shutter closes to capture the historic shot of the “Tank Man”, as the still-unidentified person is known, the screen transitions to a dedication to “those who lend their eyes to make us see”, before Leica’s distinctive red logo appears. Following the outcry, the company said that it regretted any “misunderstandings or false conclusions that may have been drawn”. China is one of Leica’s fastest growing markets, with the company planning dozens of new stores on top of its current nine.